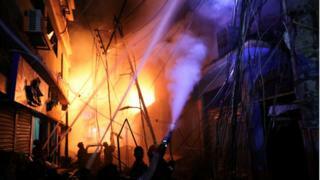 A fast-moving fire has swept through a historic district of Bangladesh’s capital Dhaka, killing at least 60. The blaze broke out Wednesday evening in a multi-storey residential building with the ground floor reportedly used to store flammable chemicals. According to local media, the fire quickly spread to nearby buildings. The fire might have originated from a gas cylinder before quickly spreading through the building where chemicals were stored, the country’s fire service chief Ali Ahmed told AFP. The blaze raced through four adjoining buildings, Mr Ahmed added. According to the Dhaka Tribune the building housed a plastics warehouse full of flammable material. “When I was at the pharmacy I heard a big bang,” Haji Abdul Kader told AFP. Bangladesh has a persistent problem with building safety regulations not being followed. In 2013, more than 1,100 people died and thousands more were injured when a building housing garment factories called Rana Plaza in Dhaka collapsed. ← Shamima Begum case: How do you deradicalise someone?